In the second-worst year for tropical tree cover loss globally, Indonesia saw an encouraging sign: a 60 per cent drop in deforestation. How can Indonesia leverage this momentum? In the midst of the second-worst year for tropical tree cover loss in 2017, Indonesia saw an encouraging sign: a 60 per cent drop in tree cover loss in primary forests compared with 2016. That’s the difference in carbon dioxide emissions from primary forest loss equivalent to 0.2 gigatons of carbon dioxide, or about the same emissions released from burning over 199 billion pounds of coal. New data from the University of Maryland, released on Global Forest Watch, calculated tree cover loss—defined as the loss of any trees, regardless of cause or type, from tropical rainforest to tree plantation—within Indonesia’s primary forest and protected peatland. The decline in tree cover loss in Indonesia was at odds with other countries’ experiences last year, with record-high loss of tree cover in the Democratic Republic of Congo, the second-highest level in Brazil, a spike in Colombia and forest disruption caused by storms in the Caribbean. The decrease in Indonesia’s tree cover loss is likely due in part to the national peat drainage moratorium, in effect since 2016. Primary forest loss in protected peat areas went down by 88 per cent between 2016 and 2017, to the lowest level ever recorded. Additionally, 2017 was a non-El Niño year, which brought wetter conditions and fewer fires compared to past years. Educational campaigns and increased enforcement of forest laws from local police have also helped prevent land-clearing by fire. 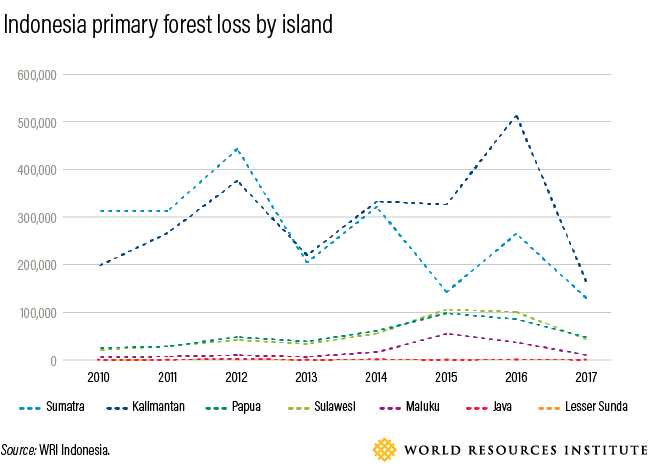 Kalimantan and Sumatra experienced the largest reduction in primary forest loss between 2016 and 2017 by 68 per cent and 51 per cent respectively, with the largest reduction seen in South Sumatra, Central Kalimantan and Jambi. 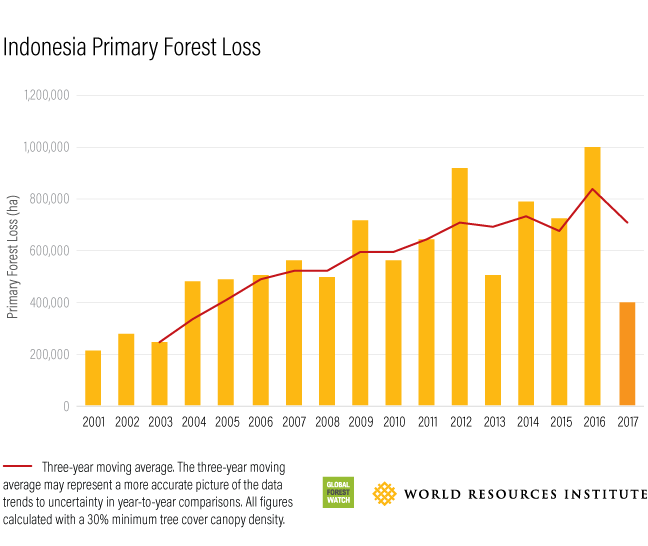 On the other hand, West Sumatra and North Sumatra saw an increase in forest cover loss. Protected peat areas, made up of over 3-metres (10-foot) deep carbon-rich organic soil, covered 12.2 million hectares (30 million acres), half of Indonesia’s peatland hydrological area. The avoided emission from peat decomposition and peat conversion is equivalent to emission from burning 630 billion pounds of coal. Provinces with the greatest decrease of forest cover loss in protected peat areas are Central Kalimantan, Jambi and South Sumatra, provinces which experienced worst fires in 2015. Such decrease may be partially driven by a longer wet season in 2017, resulting in fewer fires in peat and avoiding the 2015 fires crisis from happening again. However, the decrease also coincides with a number of government actions to curb land clearing in peatland and forests. First, Indonesia’s president established the Peatland Restoration Agency, tasked to coordinate the restoration of 2.4 million hectares (5.9 million acres) of peatland in Indonesia. Second, the government issued a regulation to ensure a suitable water level in peatland and ban all new land clearing and canal building on peatland, even in existing concession areas. Sub-national elections, which took place in June, may have also contributed to less peatland and forest fires as local politicians have greater incentive to prevent fires. This year’s Asian Games, to be hosted in both Jakarta and Palembang (the capital of South Sumatra) in August, has also driven the government to intensify efforts to prevent the burning of forests and peatland. Despite this progress, threats remain. Companies secured concession permits in large areas of protected peatland before recent protection efforts. More than a quarter of the 12.2 million hectares (30 million acres) of protected peatland has already got concession areas, dominated by pulpwood and palm oil plantations, or has the potential to be converted to plantations or agriculture. If Indonesia keeps strengthening its forest protection and climate action, 2018 could be another promising year for Indonesia’s primary forests, even when the dry season returns and the Asian Games are over. To this end, the government issued a land swap programme that obliges companies whose concessions contain at least 40 per cent of protected peatland to protect and restore those areas of their concessions. In exchange, the government will compensate them with land elsewhere. The plan drew criticism from civil society organisations, which voiced concerns that more forests could be opened without clear and transparent data and land criteria, and from companies concerned that the regulations would be bad for business. How can Indonesia leverage this momentum? First, international support for emissions reduction and green growth must be further strengthened, with this year’s international climate meeting in Poland as a venue for all countries to evaluate and log a more ambitious emission reduction target. Indonesia’s significant decrease in deforestation allows it to launch a more ambitious emissions reduction target and contribute to the global effort in raising ambition. Second, sub-national governments need more political support for sustainable development. There is already evidence that this is on the rise in Indonesia, with the introduction of Lingkar Temu Kabupaten Lestari (sustainable district platforms) and green growth programmes in South Sumatra and East Kalimantan. Third, monitoring deforestation can be a valuable tool. Spatial data tools such as Global Forest Watch provide tree cover loss alerts in near real time, enabling the government and public to prevent the clearing of protected peat areas and forests. In Peru, weekly deforestation alerts help identify forest encroachment and construction of illegal logging roads in the Peruvian Amazon. In Indonesia, monitoring government commitment to peatland protection is also part of the public’s responsibility to ensure a healthy environment. Pantau Gambut, an Indonesian civil society coalition platform that provides information on the commitments from government, public, and companies, enables public to ask stakeholders to fulfill their pledges. Finally, as a variation on the land swap, proposing a ‘new scheme’ of concessions by converting existing license on peatland into ecosystem restoration concessions could better meet the needs of all stakeholders, if it has a firm legal foundation and support from green business incentives. Hidayah (“Iday”) is a Research Analyst for the Food, Forest and Water Program at WRI Indonesia; Reidinar (Dinar) is a Communications Specialist at WRI Indonesia; Dr. Nirarta “Koni” Samadhi is the country director of WRI Indonesia; and Arief Wijaya is the Climate and Forests Senior Manager of WRI Indonesia. Dora Hutajulu contributed to the analysis for this post.This article is republished from the WRI blog.